I love simple pasta recipes which allow you to create a great dinner in just a few minutes – no matter if it is a romantic dinner for two or a dinner party for eight. This is definitely one of them! 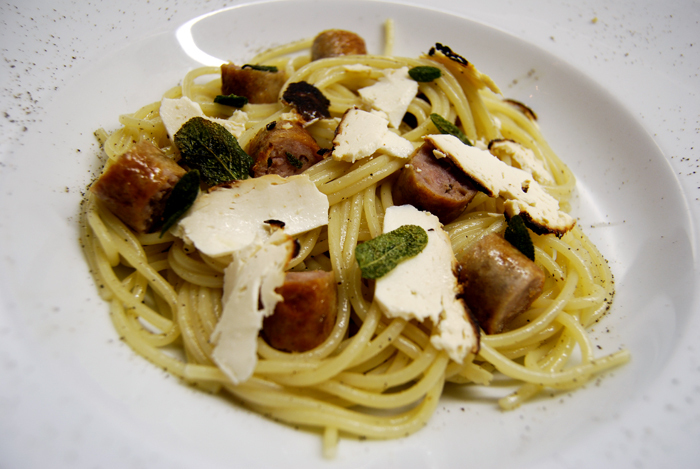 You just need baked ricotta, Salsiccia, sage (I’m lucky, my sage plant still has a few leaves) and spaghetti. 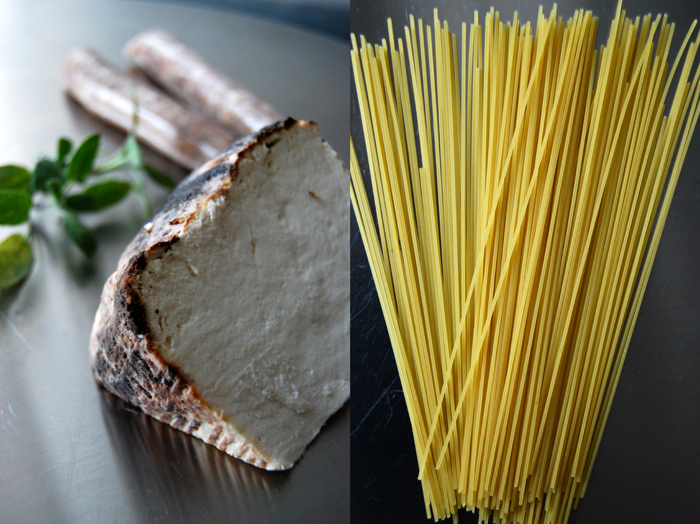 You can use any other coarse-cut sausage but the strong herbs of the Italian sausage fir perfectly to the milky ricotta. The mixture of garlic, fennel, coriander and nutmeg which is used for Salsiccia adds a nice variety of flavours. If you prefer a vegetarian version you can just melt some butter in a pan and fry a few sage leaves for 1-2 minutes (they should become crisp but not dark otherwise they will taste bitter). Together with spaghetti and sprinkled with slices of baked ricotta, this makes a delicious dinner as well! Slice the baked ricotta thinly with a cheese slicer. Rinse and dry the sage leaves and fry them in a small pan in hot butter for 1-2 minutes until crisp but still light in colour. Cook the pasta and take out a cup of the pasta water after it has been cooking for a few minutes as we need some of this liquid for the sauce. Heat some oil in a pan, add the garlic, and fry the sausages until golden brown. Deglaze with a dash of white wine and add a good splash of your pasta water. Leave the liquid in the pan but take the sausages out and cut them in pieces. Put them back into the pan together with the spaghetti and add the sage leaves with their butter. Mix and season with salt and pepper. Divide everything between two big plates and sprinkle with the slices of baked ricotta. Buon Appetito!